Homage to you, the Eight Auspicious Goddesses—Beauty, Garlands, Song, Dance, Flowers, Incense, Light and Perfume—merely thinking of you makes success grow more and more! In the Tibetan Buddhist tradition, the senses (Tib. wang po) are considered to be related to their cognitive faculties. They are associated with a certain kind of consciousness (namshe), because through them we get information about the external world. Consciousness is considered to be one of the five aggregates (phung po nga) that form the human personality. Senses,aggregates and elements (jung wa) represent psycho-physical components of samsara. 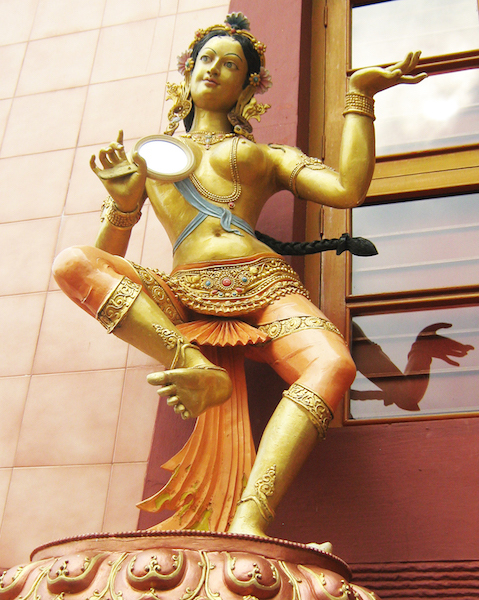 They have to be purified and transformed, which is the aim of Buddhist tantric practice. For this purpose, particular objects that stimulate the senses are used like the five sense objects, known in Tibetan Buddhism as the “five objects that please the senses” (do yon nga). In Vajrayana Buddhism they are worshipped as offering goddesses (cho pé lhamo), which have the status of female Bodhisattvas. They can be six, eight, or sixteen in number. Eight Mahayana divinities are identified with the eight offering goddesses—Sarasvati, Chunda, White Tara, Khadiravani Tara, Sitatapatra, Marichi, Ushnishavijaya, and Parnashavari (Beer 1999: 244). In The Verses of the Eight Noble Auspicious Ones written by the great Nyingma master Mipham Rinpoche (1846-1912), the eight female Bodhisattvas appear as eight goddesses who give offerings to the Buddhas. They are called auspicious goddesses who bring good luck, prosperity and turn unfavorable conditions into favorable ones. When the offering goddesses are sixteen, they are called vajra goddesses and are described in the prayer The Lute of the Gandharvas: The Garland of Offerings of the Sixteen Vajra Goddesses, which belongs to the Longchen Nyingtik—a Nyingma cycle of teachings and practice that was discovered by the great scholar Jigme Lingpa (1730-1798). The offering goddesses are some of the most remarkable examples of Buddhist art, characterized by unique beauty and rich symbolism. They can be seen as statues, murals, thangkas or ritual cards for initiation (tsag li). Their mystic nature can be expressed also through various mudras, mantras or ritual dances. 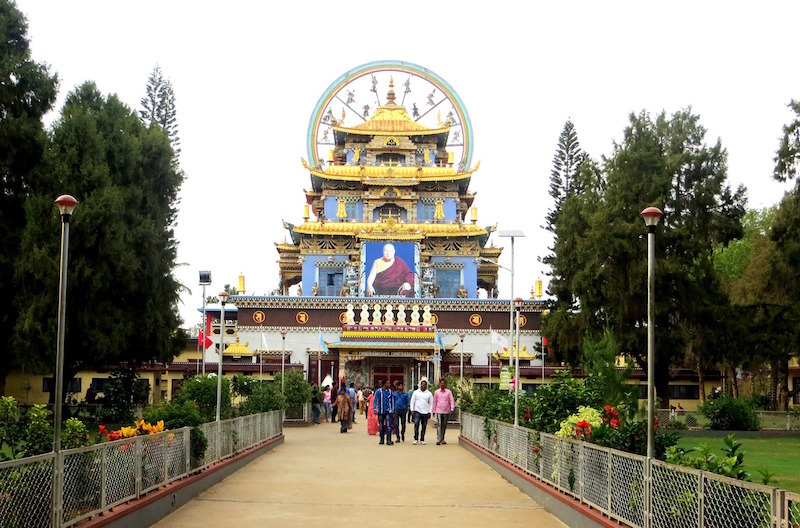 A brilliant example of the divine beauty of the offering goddesses can be seen at the Zangdog Palri Temple of Namdroling Nyingma Monastery (commonly known as the Golden Temple), situated in Bylakuppe, Karnataka State, South India. The marvellous temple Zangdog Palri, or the Glorious Copper Colored Mountain, is the manifestation of the celestial paradise of Padmasambhava. It was inaugurated in 2004 with the blessing of the late Holiness Penor Rinpoche (1932-2009), who established Namdroling Monastery in 1963. The offering goddesses at the Zangdog Palri Temple express the Indian ideal for a female body—they are sensual, playful and mystic. 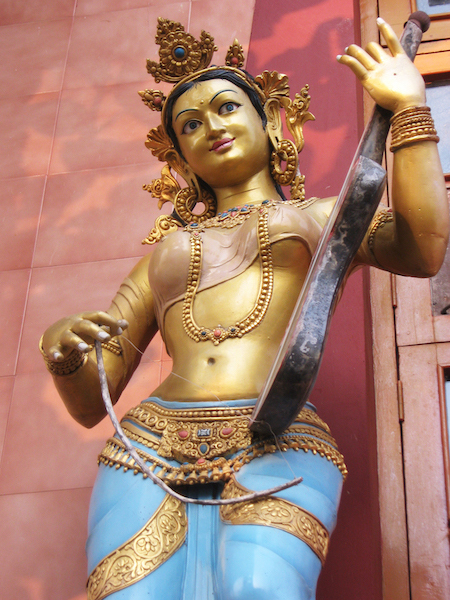 Every statue of these goddesses is a a testament to the divine, feminine beauty.